Aerial Space is a studio dedicated to the promotion and education of all forms of expressive movement and art. Trapeze, Lyra, Silks, Aerial Dance, Aerial Yoga, Acro Yoga and ... just good clean fun. Since 2009 our goal has been to contribute to the Asheville community by offering both adults and children an outlet for play, self-expression and exercise. We offer a variety of classes for all ages and skill levels from Aerial Kids to 'Find your Inner Beast' strength training. As the first circus arts studio in North Carolina, our instructors are some of the most knowledgeable and experienced in the south. As a former ropes course director and martial arts instructor, Andrew found aerials to be unique synthesis of his past. After graduating with a degree in geology from Washington and Lee University, he wandered the world teaching just about every subject out there. He joined Asheville Aerial Arts in 2008, but upon finding performing allowed so little time for naps, he devoted himself to teaching instead. Eventually he completed his teacher training at NECCA in 2010. He has also managed and taught at science centers all over the country; as a result, he’s one of the few instructors who will discuss your rotational inertia with a smile. He specializes in curriculum development, fabric theory, anatomy and injury prevention. Leah began practicing at Aerial Space in 2014 and immediately fell in love with the challenging and creative art form. Leaving Asheville shortly after, she traveled the states training at various studios along the way from the San Francisco Circus Center to NECCA. Glad to be back in the mountains, Leah is excited to share her love of circus arts and get students in the air! Craig has been fascinated with circus arts since age 10 when he taught himself to juggle from an instructional book. In 2009, he began his training in aerial arts at San Francisco Circus Center, and in 2010 he continued his training at Aerial Space in Asheville under Andrew Hartnagel and Blue De Leeuw, and also participated in the ETSU Aerial Dance program. After several years of training, he became an instructor at Aerial Space, and a performer with Asheville Aerial Arts. 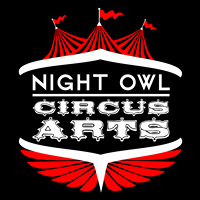 In 2013, he founded Night Owl Circus Arts in Johnson City, TN, where he enjoys directing performances, and helping people of all fitness levels and backgrounds achieve their goals in circus arts. Lisa grew up in the Catskill Mountains of New York, which nurtured the creative and contemplative parts of herself from an early age. The deep love she found for both sound and silence led her to center her life in music, yoga, and mediation. Lisa earned her Master of Music in Music Education from The Hartt School, University of Hartford, and she taught choral and general music in public schools for over a decade. Lisa transitioned from public school teaching to offer music, yoga, and meditation classes in Pennsylvania, Martha’s Vineyard, and Vermont, and has since settled in Asheville, where she is currently based. Over the past six years, her yoga teaching experience has ranged from private in-home classes to studios, fitness centers, schools, businesses, retreat centers, and outdoors, with students ranging from pre-teens to seniors. A native of Asheville, North Carolina, Jeshua began studying with Kuntao Martial Arts Society in 2010. In July of 2012, he became their first student in America to complete and successfully demonstrate the 56 basic forms of Koronadal Kuntao. He began competing in Mixed Martial Arts in 2015 and currently holds an amateur record of 2-1. Johnchel Foster (Jeshua) is recognized by Kuntao Martial Arts Society as a Full Instructor in Filipino Fighting Arts – Koronadal Kuntao/Eskrima. Valerie has been practicing aerial arts since 2010. Growing up she studied ballet and modern dance, later choosing to focus on theater arts and eventually receiving her Bachelor's Degree in theater. Valerie loves performing whether it's in on the trapeze, silks or in a rock band. Her dream is go on an aerial road trip and visit aerial arts studios all over the country. Anna has always preferred a high perch to the ground, whether on the swingset, in the high branches of a magnolia, pole vaulting, or on a trapeze. She trained as a gymnast for twelve years and taught gymnastics from 2010-2014. Her aerial training began in 2010, when she fell in love with trapeze. She has performed with Asheville Aerial Arts and Bromelia Aerial Dance Collective. Savannah Willingham has been a part of Aerial Space since 2011 as a wide-eyed lover of the circus arts, so it was only a matter of time before she joined on as an instructor. Thanks to her own childlike wonder and love of finger painting, as well as being a mother, teaching kids is her passion. Savannah is thorough in giving our aerial kids the structure and important building blocks of learning how to play on mixed apparatuses so that they can move forward in a safe and positive learning experience that still fulfills every kid's love to fly and climb. She believes you're never too old to learn and that her students have just as much to teach her as she does them. Especially about whatever the cool kids are saying these days. Lauren took her first aerial class in 2011 and was amazed to suddenly realize why people enjoy this "exercise" thing! She has been training in a variety of aerial & circus arts since 2012. Trapeze is her first and most ardent circus love. A bit of a spin & swing junkie, she relishes time on dance trapeze and does lots of dynamic movement on static (rolls, and drops, and beats, oh my!) Her trapeze sensei is the inimitable Sadye Osterloh, and she attended Born to Fly teacher training with Rain Anya of Paper Doll Militia in 2017. She enjoys performing with Asheville Vaudeville and Asheville Aerial Arts, slothing around with the occasional doubles partner, and hanging by her ankles. A place to nurture your inner knowing. Joyously and bravely let go of what no longer serves you and surrender to your brilliance! Clan Destiny Circus, based in Asheville NC, at Aerial Space is a group of circus artists, dancers, musicians, and visual artists, who come together to create new works of circus theatre. Providing top notch aerial training to anyone who wants to learn. All of our classes focus on excellence, safety, empowerment, and fun! Aerial Space alumni Craig Lewis offers classes in a wide variety of circus arts for kids and adults.